Quickspin is a young Swedish online gaming software developer making waves in the iGaming industry. 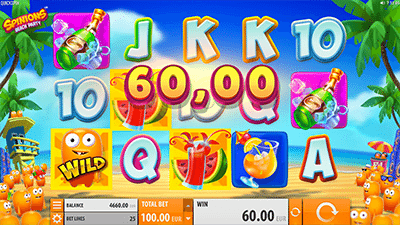 Well known for their cutting edge Internet pokies games with high-quality graphics and gameplay features reminiscent of the industry’s best, their pokies catalogue is among the most popular with real money players. Check out their games and what they have to offer in this article. 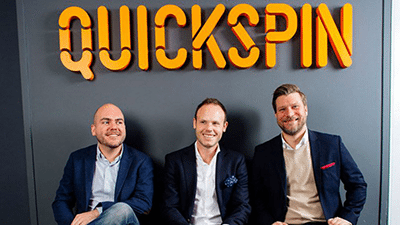 Quickspin is based in Stockholm, Sweden and was founded in 2011 by experienced business leaders and game designers at Net Entertainment and Unibet who wanted to inject a little bit more passion and innovation into an industry they say has lacked it for some time time. They quickly gained attention within the industry for the quality of their software when they were shortlisted in four categories at the EGR B2B Awards (eGaming Review Business-to-Business Awards) in 2015. The developer was acquired by Playtech in 2016, and their games catalogue has since become more widely available to players around the world. With a 45-strong staff count and over 20 high-quality games available, we can’t wait to see the studio continue to grow. With around 20 games in circulation online, Quickspin is a bit boutique in that its small number of games are very specialised and suit a certain niche of gamer – those that love intricate visual themes, stunning animations, colourful graphics, infectious soundtracks and a ton of gameplay features in their video slots. Their games have a diverse range of themes, including those inspired by popular childhood stories and legends (“Big Bad Wolf”, “Beowulf”, “Goldilocks and the Wild Bears”), famous historical novels (“The Three Musketeers, “Treasure Island”) and their own unique properties (“Seven Highs 7”, “Second Strike”, “The Epic Journey”). 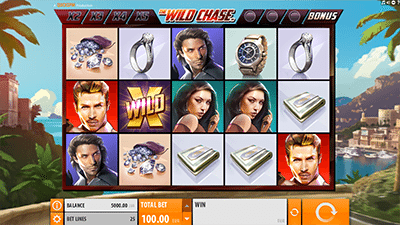 There is definitely influences from Net Entertainment present in the look and style of their games, and those that love something a little more complicated than the classic three-reel fruit machines and like to see high-quality effort put into their real money games will find themselves at home with Quickspin’s pokies catalogue. 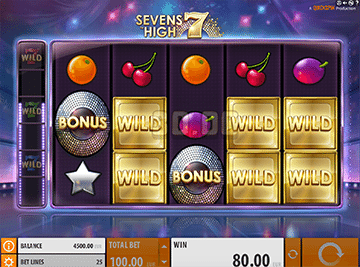 Seven Highs – With a traditional fruit machine look and feel with modern pokies gameplay features, Seven Highs is one of Quickspin’s best games. It especially caters to punters who just love the simplicity of classic pub fruity poker machines over the modern day five-reel video slots which have tons of complicated features and more complex gameplay systems. With some stellar neon animation, a relaxed soundtrack and a fruit machine aesthetic (complete with bells, cherries, lemons and stars), the game’s standout feature is the free re-spin players get automatically upon a win. Every time you spin a winning combination, expect to get another turn – and if you win again, technically the re-spins and good times can roll. Get two consecutive wins to turn one of the three sevens symbols wild – combined with the regular wild, you can get some dizzyingly high payouts. 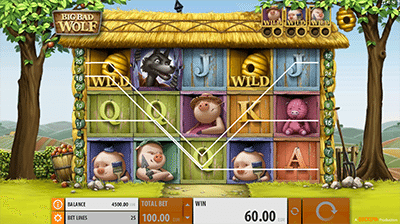 Big Bad Wolf – Quickspin’s five-reel video slot take on the classic fairy tale involving three very unlucky little pigs and a merciless wolf. The graphics evoke a storybook fell with some heavily stylised characters and a relaxing audio track for casual play. Make sure to check out the game’s Blowing Down The House feature, which emulates the Wolf blowing off the houses (symbols) into the wind once players score enough Moon Symbols, which award additional spins and a multiplier of x2 on following wins. 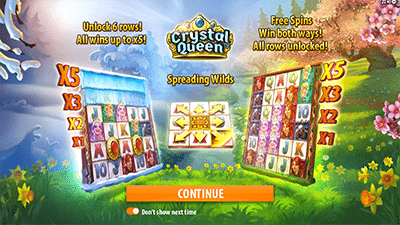 It also offers up regular free spins which can be re-triggered with Wolf Scatter Symbols. Spinions Beach Party – Clearly inspired by the Minions film phenomenon sweeping movie theatres all across the world, Spinions Beach Party is a colourful and light-hearted real money online pokie with tons of ways to win and an infectious soundtrack to keep you playing with a smile on your face. The Beach Club Free Spins feature will initiate 10 free spins for any three bonus scatter symbols you score, and Spinion Wilds will be sticky for the duration of the feature. The animation and graphics are superb and it’s probably one of the best examples of Quickspin’s dedication to attention to detail and quality. The Wild Chase – If you love fast cars, beautiful women and popular 1980s Hollywood films, The Wild Chase will resonate with you. This five reel, 25 payline pokie offers up fast wins and high payout gameplay features. Score any winning combination to trigger the re-spin feature, which locks winning symbols in place and keep scoring huge until no more winning combinations are possible. The generous regular free spins bonus round feature grants 10 free spins when three or more scatter symbols are collected in a single game round – there’s also always guaranteed Multiplier Wild during the free spins bonus round, too. Quickspin’s 20-strong catalogue can be found at the best online pokies sites hosting multiple software developers. They are now easily and widely accessible to play for practice, free fun or real money in no-download mode (also known as browser-play or instant play) – just load up your favourite Flash casino site in your Web browser (Google Chrome or Mozilla Firefox is recommended) and the Quickspin pokie of your choice and play without any need to download any software on your computer or mobile device. GDayCasino.com: You can expect to find 200+ online pokies to enjoy at G’day, in addition to Quickspin games featured on the site. SlotsMillion.com – The biggest online pokies specialist site on the Web, with over 1,100 games from 15+ software developers in addition to Quickspin’s full 20+ titles. Check out their virtual reality slots section with your Oculus Rift if you’re in the mood for futuristic gaming experiences. HouseofJack.com – With a unique aesthetic and emphasis on competitive among the community, House of Jack is one of our favourite new real money online pokies destinations and recommendations for online poker machine enthusiasts. To redeem generous sign-up bonuses such as free spins, matched deposits for bonus credits, and free no-strings-attached cash, just click any of the links above to sign up for an account and get your rewards.